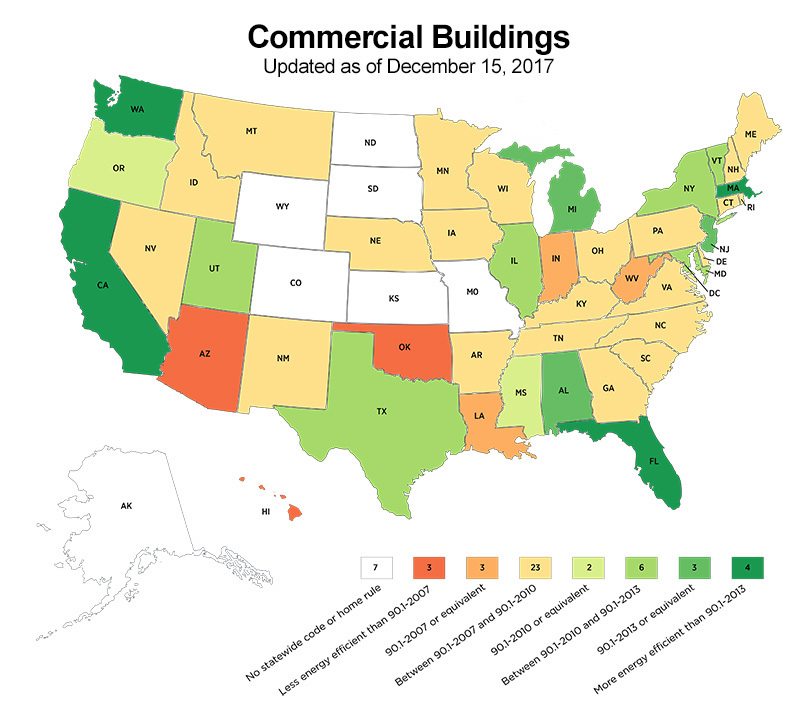 Attention: The information found within this page is based upon data from the United States Department of Energy website (www.energycodes.gov) and is provided for informational purposes only. While this page is periodically updated from that source, Lamtec does not represent or warrant that the information contained therein is current or may be relied upon for any purpose. Current energy codes requirements should always be verified with the appropriate governmental authority before proceeding. Please Note: the International Energy Conservation Code (IECC) allows the use of ASHRAE 90.1 to demonstrate energy code compliance based on the reference found in; IECC 2012, 2015 & 2018 Chapter 4, Commercial Energy Efficiency, Section C401 General, C401.2 Application, which states; "Commercial buildings shall comply with one the following: 1. The requirements of ANSI/ASHRAE/IESNA 90.1 (in its entirety). The applicable ASHRAE 90.1 standard will have been published two years prior the IECC model energy code under consideration. Also this alternative compliance option is referenced in IECC 2009, Chapter 5, Commercial Energy Efficiency, Section 501 General, 501.1 Scope, which states; "These commercial buildings shall meet either the requirements of ASHRAE/IESNA 90.1, Energy Standard for Buildings Except Low-Rise Residential Buildings (in its entirety), or the requirements contained in this chapter". The thickness and R-values for the fiber glass insulation shown above are nominal values and are provided for informational purposes only. Please contact Lamtec at 800.852.6832 with any further questions or comments.